Bengkalis island is located in Riau province and part of Bengkalis regency. 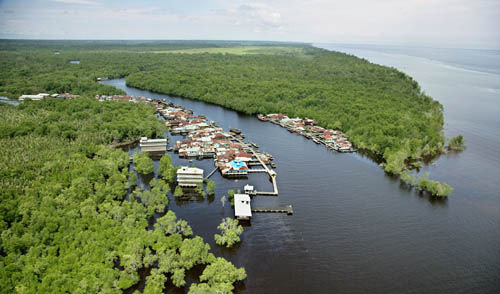 Pulau Bengkalis is uniformly covered with vegetation. The N coast is fronted by shallow ridges running parallel to it and separated by deeper channels. The village of Bantantengah lies about midway between Tanjung Jati and Tanjung Parit, the NE end of the island. During May and November numerous fishing boats frequent the waters N of the island. In Selat Bengkalis, the SE current begins about 2 hours after LW along the shore and may attain a rate of more than 2 knots. The NW current begins 2 hours after HW and at times attains a rate of 3 knots. The current near the E coast of Pulau Bengkalis has a rate of almost 2 knots and increases to a rate of 3.5 knots near Pulau Belembang and Pulau Burung. A vessel bound for Bengkalis Settlement from the Strait of Malacca may pass close along the E side of Pulau Bengkalis, round its SE end, taking care to avoid the spit which extends from it, and then proceed through Selat Padang.